What is new about how teenagers communicate through services such as Facebook, Twitter, and Instagram? Do social media affect the quality of teens' lives? 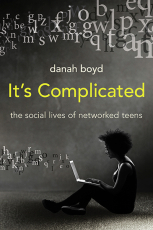 In this eye-opening book, youth culture and technology expert danah boyd uncovers some of the major myths regarding teens' use of social media. She explores tropes about identity, privacy, safety, danger, and bullying. Ultimately, boyd argues that society fails young people when paternalism and protectionism hinder teenagers' ability to become informed, thoughtful, and engaged citizens through their online interactions. Yet despite an environment of rampant fearmongering, boyd finds that teens often find ways to engage and to develop a sense of identity. This book is essential reading not only for parents, teachers, and others who work with teens but also for anyone interested in the impact of emerging technologies on society, culture, and commerce in years to come. Offering insights gleaned from a decade of original fieldwork interviewing teenagers across the United States, boyd concludes reassuringly that the kids are all right. At the same time, she acknowledges that coming to terms with life in a networked era is not easy or obvious. In a technologically mediated world, life is bound to be complicated.